Or, “12 Christmas Memories: Part III. ” If you haven’t yet, do check out Part I and II. I simply couldn’t do a series on my Christmas memories without cookies. My grandmother always made cookies for the holidays, but my mom? She goes crazy. In addition to making them for the family, she’s now started selling trays of homemade cookies and candy–and she’s doing so well that I just may have to go to America to help her next year. Go Mom! And so, making cookies is definitely one of my fondest Christmas memories. From the time I could walk, I was around the kitchen helping make cookies–although for a while there I didn’t do much other than steal chocolate chips off the table, earning me the nickname “Cookie Monster” from my mom’s friend, her baking partner for many years. But eventually I worked my way up to working with sprinkles and candied cherries. You know, the Big Time. My mom made it fun not only for me but also for the friends I was allowed to invite over to help decorate the cut-out cookies–there were far too many stockings and Santas and snowmen and bells and wreaths for just one or two people to decorate. So at my mom’s house, we’d have decorating slumber parties every year between Thanksgiving and Christmas. Just the other day, in fact, one of my best friends and regular participants in the bake-a-thons left a comment here on the blog longing for the days of such innocent fun. And I’m so with her on that. And yes, in case you’re wondering, my niece is fully prepared to keep this tradition going. Just the other day my mom said that she’s getting to the age where she can have some friends over to help decorate (she already helps my mom with the cut-outs). So next year, 9-year-olds at Nana’s! Before this year, I have never done the Christmas cookie thing by myself–why would I when my mom had it covered? But now that I’ve been here for a few years and have really missed those tastes of home, I decided that this year I’d make some of my mom’s recipes and give out trays to Italian family, friends, and neighbors. I highly doubt any of them have ever even seen the cookies I made, so it’ll be an interesting experience for all of us. Yesterday I finished up the last of six types that I made this year, and I’ve already decided that next year I’ll try my hand at even more. My mom had sent me some things like chocolate chips and brown sugar, but since I decided on Operazione Biscotti at the last minute, some cookies just weren’t going to happen this year for lack of the proper ingredients and tools. But look out Christmas 2008! 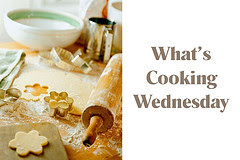 I’m not going to share all the recipes with you now, or even the photos just yet, but I will let you in on what has to be one of the easiest and tastiest cookies ever for this week’s What’s Cooking Wednesday. In fact, this is a great one to make with kids because they get to play around in the dough as much as they want and they really can’t ruin it. “Unless their hands are dirty,” adds my mom.The words of wisdom never end I tell you. These classics will also be my entry in Food Blogga‘s Eat Christmas Cookies event. Go check out all the great cookies over there–just beware you’ll probably leave hungry. 1. Combine flour and sugar and then cut in butter until well distributed. Sprinkle with vanilla and mix dough with hands until smooth. 2. Shape into 1 inch balls and place about 1 inch apart on greased cookie sheet. 3. Indent centers with lightly floured finger (or thumb!) and fill with jelly. 4. Bake in preheated 325°F (163°C) oven for 15 minutes or until golden brown. 5. Remove to rack to cool. Easy peasy and tasty too! *I should note that the original recipe calls for a cup of chopped nuts–I just don’t like them in this, so I don’t put them in. If you want to, put 1/2 of them in with the flour and sugar in the beginning, and then, after you make the dough into balls, roll them in the remaining nuts. Thanks Christina for reminding me to include this! These will be perfect to do with my kids – and better yet, egg-free so I can have some too. I so love those cookies, and the bake-a-thons with your mom sound like so much fun! We never baked when I was growing up, so I’m learning all that now, and enjoying it a lot. Your recipe IS easy – I may make those in the next day or two. YAY! I’m going to try this recipe. Hopefully, it will come out great, and I’ll have some homemade cookies to leave for Santa! HMM…these sound yummy. I’m not much for cookies (or sweets in general), but every now and then I get a craving for cookies…these could fit the bill. Looks delicious. My MIL makes a similar recipe, but she rolls it into a log, and makes a gutter down the middle that she fills with jam. She then bakes them, and cuts them into biscotti-like diagonals while still warm, and drizzles a milk-powdered sugar icing over them. “Grownup thumbprints” is what we call them. Christmas cookies are one holiday tradition I have never been a part of. My mom made exactly ONE kind of cookie (mint meringue), and she made them all by herself. Everyone in town loved them; they were sort of her trademark, but by the time I was 11 or 12, I was so sick to death of them that I don’t think I’ve had one since. Beautiful, these look like real kid’s cookies. 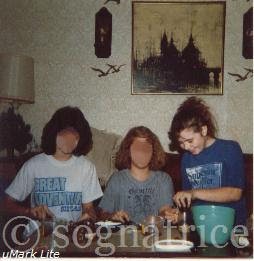 Sognatrice, I loved reading about all your happy memories of family and food. Sounds like your keeping all the traditions alive in your own home. I have to tell you, after looking at your photos of that ricotta poundcake you made I earmarked it for future baking. Well, that was yesterday, and I made 2 loaves 1 I gave to a friend,and the other for my Hubby,who loves ricotta anything! In his, I added a little limoncello, it was truely delicious!! Thank you, that will be a keeper in my family. Hey, my daughter had big hair like that back in the day. She’ll be here Saturday to bake cookies with her Mom and her friend Sam & I will be eating them as soon as their backs are turned!!! These food posts always make me hungry. *Jen, we’re all about easy here; I hope you get to make these! *BLC, why yes they *are* grown up thumbprints. Mmmm…. *Stefanie, I can see how you’d get sick of just that one cookie. I’ve gone through phases with my mom’s as well–some years I couldn’t stand another butter cookie and then other years, they were my favorite. Go figure. oh… right, I forgot about the elevation. Hm. Eh… I will look around and see what can be found. Oh dear, this reminds me, I am supposed to make my Nana’s Christmas cookies every year. She said to me, “Someday when I am gone, you will have to make these and give them out to the entire family”. I tried for a year or two with mixed results, and lots of stress, and gave up. They are a type of sugar cookie (with buttermilk) but are thick and end up turning out more like cake. I miss them each year at this time, and fully intend to make them again in the near future. It is just that I have everyone over to my house for Christmas, and in past years have been a bit overwhelmed (with cleaning, cooking, Santa and kid stuff), but I seem to be handling it better this year. so maybe I should make them. Oh I love these. Grandma Linda makes them every year for Christmas. *Taffiny, get baking! I think your grandmother will help you if you just ask…. *Shan, that Grandma Linda is a smart cookie. Hah! Just doing a little teasing on the hair! These look super. 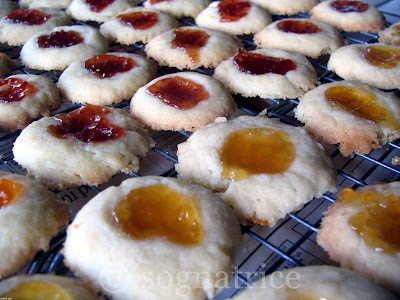 Remind of of ‘jam cookies’ I loved as a child back in India. I’ve been away from your blog far too long…and just look at what I’ve been missing. I screamed (@ work) when I saw that old picture of us. Such great times. I’ve got so much catching up to do, I’ll send you a length message soon. Hope all is well. Happy New Year. I’ve always seen these cookies around, but never realized how simple their recipe is. Why, even I could make them! Hope you’re well.